The thrust of your keyboard lessons should be to get to know the keyboard. For a solid piano-playing foundation, you need those 88 keys solidly stamped into your mind and into your fingers. 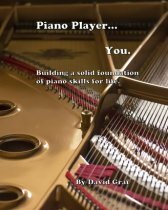 The approach at this website (explained in depth in the ebook, Piano Player... You) involves building your keyboard awareness through exercises, scales & chords, piano tunes, music reading, and learning & memorizing piano pieces. As you begin your piano journey, understand that it's a long trip and you need to learn to take pleasure in all the small steps that will get you where you want to go. When you spend time working on the various elements of your piano-playing, you can enjoy knowing that you are progressing and your skills are growing. Don't ever feel that you are wasting your time. Below, you will find links to each of the areas you will need to begin studying. You can divide your practice time evenly between them all, or you can focus on the specific area (or areas) that you like the most. Just know that for a solid piano-playing foundation, you will want to someday make all of them a part of your practice routine. Each page of the website will offer video tutorials and music notation to help you. Read the introductions if you want to understand how and why you should practice each item. 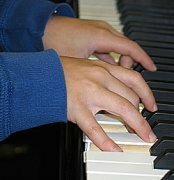 For a series of exercises designed to get your hands and fingers going with basic piano technique, click here. For a comprehensive plan of exercises, scales, chords, and other stuff, click here. For a solid concept of how to learn chords, click here. For a series of 17 familiar tunes designed to get your hands on the keys, learning notes and fingers, click here. For ideas on how to start reading music, click here. For ideas on how to practice: visit "How To Practice". For more extensive explanations of music theory: Click here.